If one were to name one Savannah-based musical act that most exemplifies this time-honored, eclectic and adventurous city, they’d be hard to find a more appropriate ambassador than Velvet Caravan. 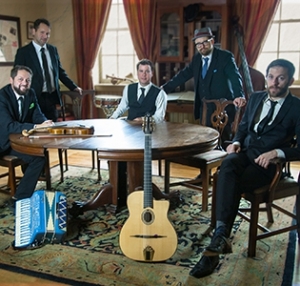 This unorthodox, high-energy, acoustic-based quintet of guitar, violin, standup bass, percussion and keyboards (including accordion) has, over the past few years, emerged as one of the shining lights of Savannah's burgeoning music scene. In that time, the band has grown from a somewhat informal instrumental combo which routinely drew enthusiastic and loyal followers at raucous restaurant and bar gigs to a respected and admired touring act that’s as comfortable in an attentive listening room or large concert hall as they are in a crowded nightclub. Velvet Caravan's unique ability to subtly shift musical gears without sacrificing their integrity as composers and performers is rare indeed. This has resulted in an envelope-pushing group that's just as successful at dazzling jaded cocktail drinkers as they are at commanding the rapt attention of serious music aficionados in whisper-quiet recital environments. Of late, the band has even taken things a step further, by mesmerizing and inspiring even the most finicky of schoolchildren through fun and engaging music educational programming. "Gypsy Jazz is the root of our sound and style, but we are far from being a traditional band in that genre," explains the group's co-founder, classically trained Venezuelan-born violinist Ricardo Ochoa.